Everyone, stop getting upset about the Disney/Marvel thing. Since it was a $4 billion dollar deal it's not as if it's some lovely fluffy little indie company that's vanished. As people have pointed out, Disney generally leave companies they acquire (Pixar, Miramar) to get on with doing what they do, mainly because that's how they've made the money Disney bought them for. Awwww! I'm not even bothered by the Marvel/Disney thing, but I still felt my blood pressure go down several points when I saw that picture. You have some gorgeous kitty children there! aw, they're sweet! 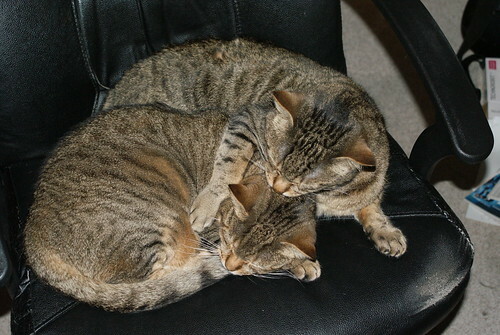 Spooning cats! Disney have produced some great films (more so in later years when they're not cartoons), dunno what all the fuss is about, as you say, both are huge, money making conglomerates. Absolutely meh about the whole Disney/Marvel thing; never cared for superhero comics and always preferred Bugs and Daffy to Mickey and Donald. But those cats of yours are adorable. Aaaaaaah! If you tilt your head about 50 degrees to the left, you can make that photo into a very strange suto-stereogram. People are getting upset at the prospect that Disney will mess with the purity of Marvel's vision? Link me to them lulz! Yeah, not a fan of Disney OR Marvel, am a fan of tabby cats.